Brian Lesser signs a lot of checks, and he quite prefers that to go unknown. 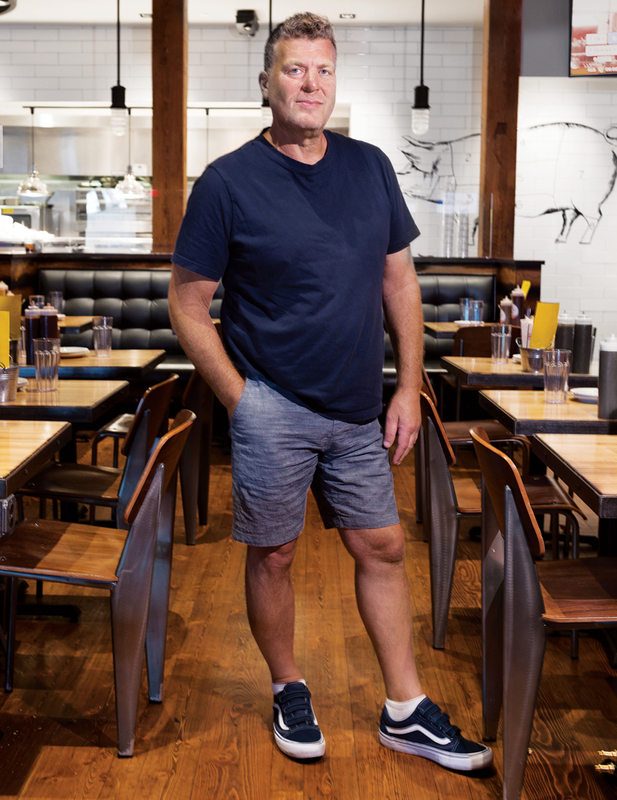 It’s a sunny Wednesday afternoon in mid-June, and the owner of the hottest collection of restaurants around, including Alden & Harlow, is noshing on barbecued pulled pork at the Smoke Shop, in Kendall Square. “Did you ever notice there are two kinds of good tippers?” Lesser asks rhetorically. “Those who need to let you know about it—and those who don’t.” Wearing baggy shorts and an oversize T-shirt, with dark sunglasses resting on his salt-and-pepper hair (his reliable everyday uniform), Lesser doesn’t look the part of a local tastemaker with fat-cat investors and celebrity chefs on speed dial. Even by the end of his lunch, it’s unclear whether the waitress realized she’d just served the guy who not only paid her tip, but also signs her paychecks. As president and CEO of Speakeasy Hospitality Group, Lesser’s track record is sterling: 11 openings, with more on the way, and just one closing. The company’s current portfolio of high-profile, chef-driven hot spots boast combined revenues of $34 million. After 30 years of running restaurants, Lesser—who lives with his wife, Jana, and three sons in leafy Weston—has won the kind of stability that can seem elusive in the culinary world. His recipe is simple: Find the best talent and silently build an empire. It’s no surprise, then, that with each pocket-deepening success, Lesser extends his influence over the region’s restaurant scene, whether diners know it or not. As chefs continue to serve as cults of personality, he’s the star maker who gives them a platform to shine: a Svengali who can launch careers, set local trends, and shape city tastes while reaping big rewards, all by following his unique business formula. His first smash hit was in 2011 with Sweet Cheeks, a Fenway restaurant that marked the highly anticipated debut “solo” effort by chef Tiffani Faison, runner-up on season one of Top Chef. Soon after, Lesser had his hand in Harvard Square’s hat trick of fine dining: Alden & Harlow, Waypoint, and the upcoming Longfellow, all with chef Michael Scelfo, whose profile skyrocketed after he earned a prestigious James Beard nomination for his work at Alden & Harlow. Meanwhile, Waypoint was honored in May as one of Food & Wine’s best restaurants of the year. Lesser also has big plans for the Smoke Shop, his partnership with barbecue guru and Hell’s Kitchen alum Andy Husbands. A Boston location is slated to open in December, a third outpost will arrive at Somerville’s Assembly Row in the spring, and Lesser is also looking into merchandising opportunities. Other Lesser-owned properties include Naco Taco, a kitschy Mexican restaurant in Cambridge, and a pair of nightclubs: Storyville, in the Back Bay, and Tunnel, a subterranean dance den under the W Boston hotel. On the surface, these properties have little in common. You’d never know the same guy was behind each one. Whether he likes it or not, though, Lesser is not as low-profile within the local hospitality world as he is among diners who show up at his restaurants each night for great food and a glimpse of a well-known chef. Of the half-dozen insiders I spoke with, everyone seemed to know of him, though far fewer knew much about him. From his partners to industry publicists, some gushed while others huffed about his bullnosed, father-knows-best approach. What’s left is an urban legend whose reputation occasionally coalesces into that of a gourmet Godfather, as well as someone who gives glimpses of a soft side even as he’s entirely capable of playing hardball. When it comes to Lesser, the real story is a whisper in the night. Who is the Wizard of Oz behind the curtain of Boston’s restaurant world? And is his unique way of doing business strengthening the local dining scene and cultivating the next generation of culinary stars by launching their careers? Or is Lesser merely riding talented coattails all the way to the top? Each of Lesser’s deals is its own special snowflake. Given his self-acknowledged reputation for privacy, I was more than a little surprised that he laid out his basic recipe for success: The majority of his projects, he tells me, start off with around $1 million, largely money he and his deep network of investors bring to the table. He and another operator, usually the chef, go in together as general partners. Lesser handles the back-of-house business: building the initial operational backbone and then running the ongoing finances. At first, as dollars start to roll in, investors take the lion’s share. Once they’ve recouped their agreed-upon rate of return, say 125 percent, Lesser muses, the deal flips: General partners, including the chef, earn the majority of the money, while investors divvy up the balance for the life of the restaurant—akin to earning royalties on a song they cowrote. Lesser, who says he often maintains a majority interest in his properties, considers it a solid success to flip a deal in four years. After studying business and hospitality at the University of Denver, Lesser took a job in New York City with Loews Hotels, then became director of room service for the Helmsley Palace, managing a department that generated $7 million a year and seeing the hyper-exacting standards of billionaire businesswoman (and eventual convicted tax evader) Leona Helmsley, the so-called Queen of Mean, up close. “She spoke like a truck driver,” Lesser tells me. “Everything was f-this, f-that. She was really tough, really difficult, and she’d fire people left and right. Sometimes she’d rehire them in the same sentence.” Still, he says, “I learned some valuable lessons.” Helmsley’s commitment to quality, for instance, was unimpeachable, and Lesser liked her philosophy: Guests may not always be right, but they’ll get whatever they want—provided they can pay for it. Chef Tim Maslow, a golden boy of the fine-dining world until he folded his restaurant and fell from grace, says his cautionary tale is the perfect example of why Lesser is an asset to rising chefs—and, by extension, to a restaurant scene that benefits from having a veteran businessman guiding its next generation. For just three years, Maslow owned Ribelle, in Brookline. The esoteric Italian-inspired eatery received a rare four-star review from the Globe in 2013 and oodles of national nods for its then-29-year-old culinary star. Unfortunately for Maslow, his boy-wonder status in the kitchen didn’t translate to the back office. One ill-advised business decision after another eventually forced him to close the restaurant. Around the same time, U.S. agents arrested him near the Canadian border in Vermont on drug charges—an incident well documented by the press. Though the charges were dropped within a few months, Maslow was left with a wounded ego and a stained reputation. That’s when Lesser moved in. At first, he tapped Maslow as a consultant for Mida, hoping to bring some added sizzle to the South End spot. The duo, Lesser says, is also finalizing two locations for a new “forward-thinking” restaurant concept. Maslow vows that this time will be different. “The downfall of Ribelle,” he says, “was that 80 percent of my time was pulled away from the kitchen and toward administrative drama.” He wishes he’d had an objective voice in his ear to keep his spending in check. “There was no one to give it to me straight,” he tells me. “I needed somebody to tell me I was spending double what I should for that location, that I didn’t need an $80,000 cooking suite. I needed someone to sit there and draw the lines for me so that I could color within them.” In a city where restaurants seem to open and close as often as diners’ mouths, a seasoned pro like Lesser offers a fighting chance for chefs big on vision but short on operational experience—ultimately pushing the local dining landscape in interesting and progressive directions. Not everyone who works with Lesser, however, is as enthusiastic as Williams and Maslow—or as eager to talk about him. A number of people who have known or worked with Lesser throughout his career didn’t respond to interview requests, while others declined to comment when asked about their experiences. Some described a hard-nosed businessman with a paternalistic approach, which is bound to bring out mixed emotions—especially when chef-size egos are involved. Lesser’s immediate air is of someone wily but warm, likable if a little inscrutable.